I have been finding trap dustshoot and mind crush rather interesting and since the prohibition of delinquent duo, forceful sentry, confiscate, these 2 are the better hand destruction choices left. Hence, i would like to do a comparison between these 2 cards. 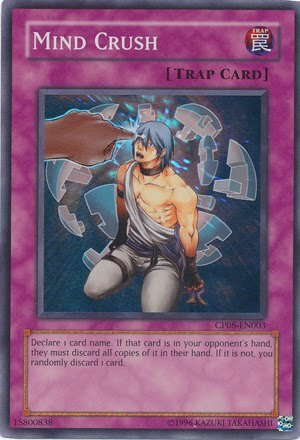 MIND CRUSH/ Effect: Declare 1 card name. If your opponent has the declared card(s) in their hand, discard all of the declared card(s) to the graveyard. Otherwise, you randomly discard 1 card. TRAP DUSTSHOOT/ Effect: Activate only when your opponent has 4 or more cards in their hand. 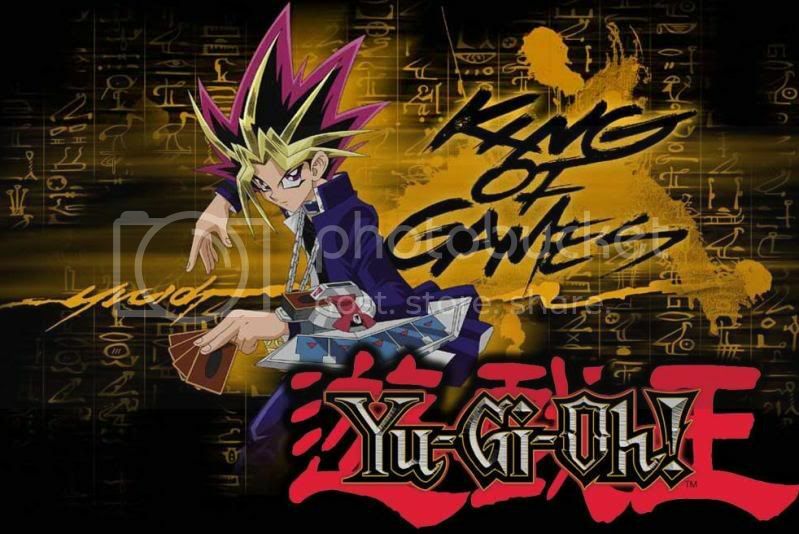 Look at your opponent's hand, select 1 monster card in it, and return that card to its owner's deck. 1. Both players must have at least 1 card in their hand in order to activate mind crush. 2. If the player does not have the declared card, you can check their hand to verify. You can even check their hand if you declared kalut and your opponent discard 1 kalut, because you suspect him to be hiding 1/2 more kalut. 3.If an effect like "trap dustshoot" is chained to the effect of "battle fader" so that "battle fader" cannot be Special Summoned, then the effect of "battle fader" which ends the battle phase is also not applied. 1. You can still activate mind crush if your opponent has 4 or less cards in his hand, making mind crush more useful and less situational than trap dustshoot in late games. And it really is not helpful at all in the late game, because most of the time, your opponent has less than 4 card in their hand. 2. Even if you "guess" it wrong, discarding may be good for you. Because you can always discard away the guardna, vayu, zombie carrier etc which helps you better when they are in grave than in your hand. 3. You may end up discarding 1 or more cards from your opponents hand, try this on gadgets, its fun! 4. 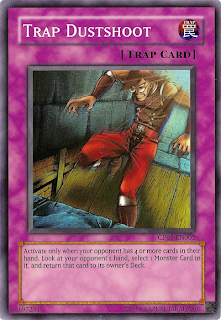 Though drawing trap dustshoot in the very early stage of the game is extremely helpful to lead an advantage for you, you may end up seeing a hand of no monsters. 5. It is really easy to know what your opponent holds these days, especially decks like BF, zombie( with searchers like goblin zombie), machine (machina gearframe, gadgets are good examples), lightlords, gladiator beast etc. Note: Trollandtoad will be the proud sponsor of this blog from now on.